BUY MORE SAVE SHIPPING Expedited Shipping Through DHL and FedEx 4 - 7 Days Delivery (Don't be surprised if it reaches earlier sometimes when customs clearance procedures are required, it can cause few days delay) This nourishing shampoo is a blend of pure kelp, natural proteins, peppermint oil and mint leaf extract, to gently cleanse hair and invigorate the scalp for fresh growth and healthier shine. 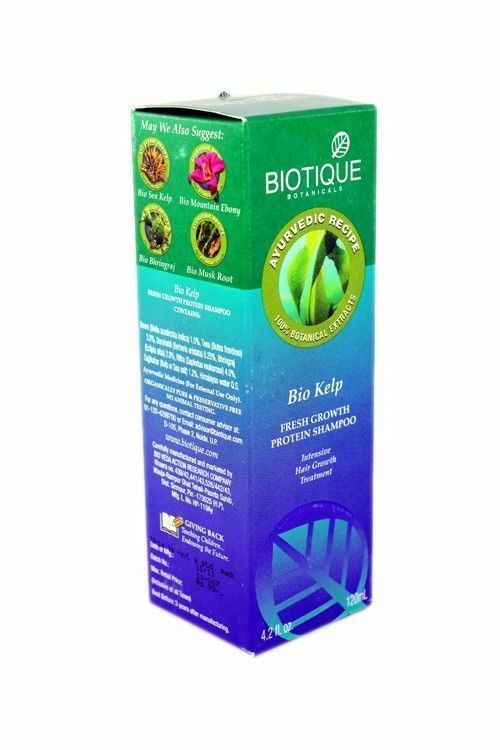 Key Features Natural Extracts Intensive Hair Treatment Penetrate Hair Shafts High in Vitamins, Nutrients and Minerals Hair Growth and Strengthening Properties Retards Hair Loss Nourishes Scalp Natural Extracts This shampoo is an amalgamation of vitamins, minerals and nutrients that come embodied in natural kelp, seaweed, which nourishes your hair to improve its texture and feel. 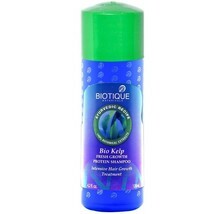 Intensive Hair Treatment Extremely dry and damaged hair needs intensive care and this Kelp Shampoo brings exactly that with its unit of natural extracts and brilliant composition of nutrients. 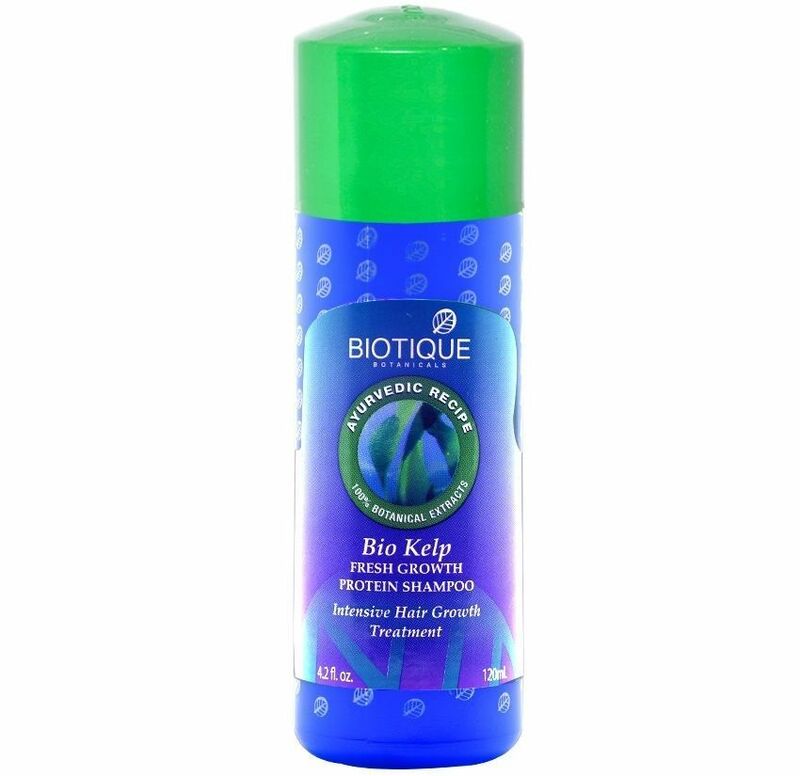 Hair Growth and Strengthening Properties Shampooing with this Biotique Bio Kelp Fresh Growth Protein Shampoo will keep hair growth accelerated by stimulating your scalp for better blood circulation. Your hair roots will grow stronger, ensuring that hair loss is drastically reduced so you always have a healthy mane. Conditioner The conditioner penetrates the delicate and damaged hair shaft to nourish from within so your hair remains well moisturized for easy handling. Ingredients Neem (Melia azadirchta indica), Tesu (Butea frondosa), Daruhaldi (Berberis aristata), Bhringraj (Eclipta alba), Ritha (Sapindus mukorossi), Sajjikshar (Kelp or Sea salt), Himalayan water Q.S How to Use Apply liberally to wet hair and work lather through strands, from scalp to ends. Rinse well with water We work hard to ensure 100% satisfaction on every customer purchase. If you have any issue with your purchase, please let us know prior to responding with negative feedback. This way we will be able to better address the situation to your advantage. Please do not file Item Not Received Case or Item Not as Described Case. If you contact us, we will resolve any issue in your favor faster than eBay Resolution Center. We reply all the mails within 8 hours. Also don't forget to leave a positive feedback if you are satisfied with our services.